The last time I did mortar lines on a brick building was c.1983. I'd just built my first structure kit (a Plasticville brick city building, IIRC). It was already molded in red, so "No Painting Necessary." But I'd read somewhere that you could get a neat mortar effect by applying white paint to the walls and immediately wiping it off. It worked great. Fast forward over almost 32 years later, and I'm ready to try again on my Ballantine's beer warehouse. But things have changed - I've become a more "sophisticated" modeler. I actually paint the brick walls on my kit (heh - it helped that the brick was molded a "stucco" color and I wanted my bricks to be red). But therein lies the problem - adding mortar lines isn't as easy this time around. As you can see, the effect is underwhelming. I think the problem may be that the brick red paint I used was Floquil - flat flat flat. And I suspect the reason the compound isn't coming off the face of the bricks as nicely (as it would if the bricks were unpainted styrene) is that the flat brick paint has taken in some of the compound (it hasn't absorbed anything - the walls have been drying for almost two months(!)). Fortunately, that long wall is the wall that will be facing the backdrop. And the other walls won't be used in the final build, so I have some more chances to practice. The next technique I tried was a wash of light gray PollyS (water based) paint, thinned 3:1 with acrylic thinner. That came out better, but still heavy (too light in color). Finally, I'm trying thinning 5:1 with 91% isopropyl alcohol. Apply with a brush, then wipe off. That seems to be working ok, though I'm not sure about using alcohol rather than water (or acrylic thinner) to thin PollyS paint. But I thought the alcohol would evaporate more quickly and leave the color in the lines more easily. What technique do you use for adding mortar lines to your brick walls? Do you paint the walls a brick color first? Does it matter whether it's a glossy or flat finish? Do you ever use alcohol to thin acrylic/waterbased paints? Let me know - as always, any thoughts/suggestions/guidance are MOST welcome! I'm working on a Walthers kit and used a technique I saw in a video on YouTube. First I spray painted the brick wall pieces with Rust Oleum paint/primer in a satin finish. Then after it dried I brushed on a 50/50 mix of white acrylic paint and isopropyl alcohol. I brushed off as much excess as I could immediately with a dry brush then used a magic eraser to get the rest. It seemed to work ok for me. I also tried a 50/50 mix with water and it seemed to work slightly better. Thanks for stopping by Paul! I tried a similar technique involving a wash of MILW gray thinned 5:1. Seems to have worked out really well. Thanks also for the link to your blog - I look forward to visiting! 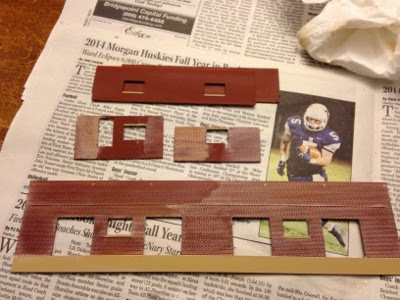 Depending on the brick 'relief', and other brick details like window sills, etc., I will usually paint the whole shebang with the mortar color first, then apply the brick color to only the surface of the bricks using a cosmetic sponge. Hey Galen - good to see you back! I've heard of that technique, but felt it was too risky - at least for my level of skill. I'd be afraid of the mortar lines filling up again with the brick paint. The only method I've tried uses acrylic paint brushed on a small area at a time. Before it dries completely I wipe it off at an angle to the mortar lines, like grouting tile. Thinning it made it a little easier and extended the working time, but you use more paper towels. It dries with a little haze to it but the more buff the clearer it comes out. Also the quality off the model makes a difference. I had better results on the Cornerstone and DPM model. I tried it on an old AHM repair shop and the effect wasn't as good as the mortar lines are a little larger. Hi Michael and thanks for your tip about wiping the paint off at an angle. I hadn't thought of doing that, but will definitely try it on the next brick building I do. Sounds like it'd make it less likely that I'd wipe anything *out* of the joints by accident. I use 5:1 mix of Polly S concrete or Model Master concrete acrylic with 4 parts 70% denatured alcohol, 1 part water and a drop of Dawn so it will flow better. I don't wipe it off as flows into the mortar lines. Works pretty well. Those are great tips Bill - thanks for sharing them, and thanks especially for posting them here for easy future reference.